The news media narrative in the 2011 federal general election, by May 2nd, was clear: what began as another boring election surprised everyone when it actually got interesting. Leaving aside the troubling notion that anyone would characterize a democratic election as “boring” or “unnecessary,” the narrative came to focus on the NDP surge and the possibility that the party might become the Official Opposition. This morning we now know that the Liberal Party, once known as Canada’s so-called “governing party”, has been reduced to the third party in the House of Commons for the first time in Canadian history. This, of course, was not the first time that one of the traditional political parties in Canada was reduced to third party status. This first occurred in the extraordinary 1921 federal general election, the first federal election after the Great War and the first election in which most Canadian women could vote. The 1921 election was also the first time that a non-traditional political party, the Progressive Party, won the second largest number of seats in the House of Commons. 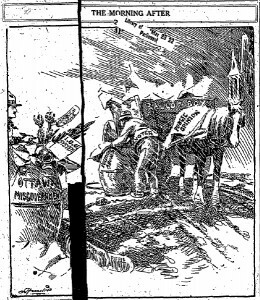 Riding on the coat-tails of the United Farmers of Ontario provincial election victory in 1919, a coalition of dissatisfied Western Canadian and Ontarian farmers along with Liberal Party defectors coalesced around the leadership of Thomas Crerar to form the Progressive Party in 1920. This new party disrupted the status quo of two-party politics in Canada and captured seats in BC, the Prairies, and Ontario. The party refused to take on the role of Official Opposition, in part, due to its commitment to constituency autonomy and a rejection of central party discipline. 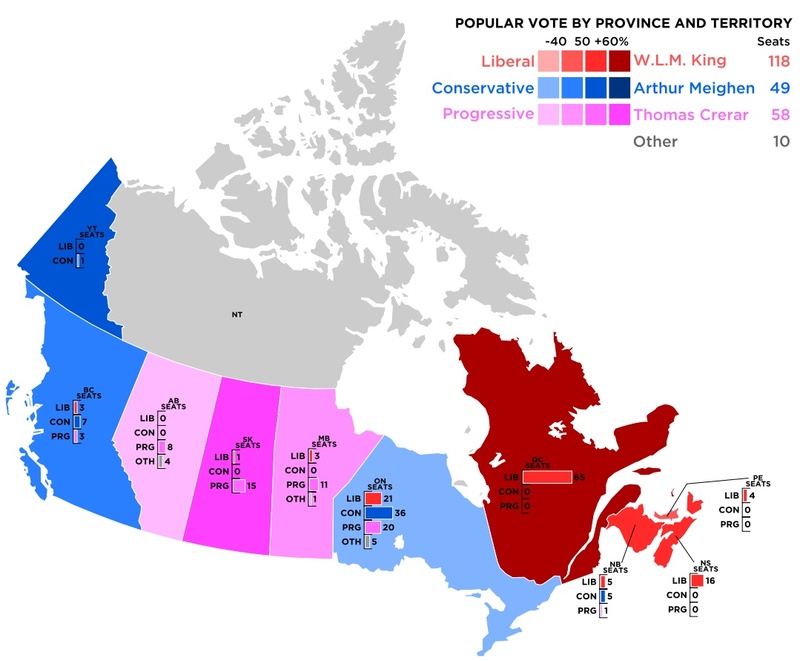 The Conservatives, under the leadership of the “autocratic” Arthur Meighen, took the role of Official Opposition, even though the party did not hold the second largest number of seats in the House of Commons (gasp!). The day after the election, on December 7, 1921, the Globe, a Liberal Party organ at the time, smugly declared victory for both William Lyon Mackenzie King the “Little Rebel” and Thomas Crerar “The Leader of the West”. The short-lived reign of Arthur Meighen came to an abrupt end as his party was “swept out of existence,” according to the Globe, and “Conservatism as a political force… ceased to exist.” While this analysis was somewhat exaggerated, it was clear that news media coverage in 1921 recognized the significance of this shift in the Canadian political landscape. It was not until 1993, when the Bloc Québécois formed the Official Opposition and the Reform Party won the third largest number of seats, that non-traditional political parties once again disrupted party politics in Canada. Today, on the morning after the 2011 federal general election, we see once again how non-traditional third parties, like the Progressives, the Bloc Québécois, the Reform Party and now the New Democratic Party, can offer an alternative for Canadians when the traditional parties fail to provide voters a choice.